Starting form the west-end of the biggest lake in South-Trøndelag the river Nidelva enter after 40 km the city centre of Trondheim and discharges into the Trondheim Fjord. Six hydroelectric power plants are located along the river. Due to the large catchment area of 3.178 km2 the river carries a lot of water. Due to regulations measures which have reduced the discharge about 110 m3/s compared to the normal conditions smaller floods could be prevented. However, the occurrence of huge flood events could not been avoided (NVE, 2001). Gale-force storms in the Trondheim Fjord and spring-tides increases the sea-level up to 50 cm and the water level of the river Nidelva due to backflow. The sewer system in Trondheim consist of roughly 50% combined system built before 1965, 40% separate system and 10% non active separate system. About 100 combined sewer systems pollutes the river and the sea during heavy rain and snow melt. 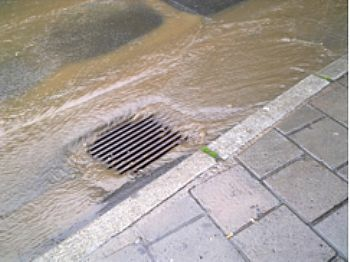 On many places in Trondheim the sewer drainage system is not designed for peak runoff discharge. The insufficient capacity of sewer system leads often to flooding. Natural disasters such a flooding can cause entire lifelines in a city or larger area to fail. In some cases, the government is forced to declare a state of emergency. Even if the flooding is of minor scale it can cause severe damage to infrastructure and critical buildings in which network control units are located. To implement the right protection measures, communities such as Trondheim have to understand the risks from flooding. Risk assessment is a way to qualify and quantify the vulnerability of critical buildings and infrastructure. A coarse Risk and Vulnerability Assessment (RVA) can help to identify risk events and resulting consequences based on a simple risk estimation, which however cannot provide detailed information of risk such as affecting peoples, properties and infrastructures. Advanced numerical models must be applied to identify risk areas, vulnerable bodies and levels of the risk with regard to given risk scenarios. Up to now a tool was developed to assess the potential risks as a simplified analysis or to calculate the frequency of identified events as a comprehensive analysis. Users can choose the type of analysis according to their needs and preference. The results are based on a simplified analysis. Municipality can use the result as a reference for immediate actions or short or long term planning for adaptation and mitigation and for further analyses. As an important part of urban flood management, planning of stormwater management at municipal level and use of Sustainable Urban Drainage System (SUDS) measures are addressed. SINTEF is following a three-stage approach comprising RVA, GIS-based analysis and ID model simulations, to make assessment of flood risk for a selected area in the pilot site Trondheim. Subcatchments of higher and lower development areas are selected to demonstrate the need for data (both types and quality) and methods to perform the analyses. Impacts and dependency of urban drainage system on other infrastructures will be an integrated part of case studies. Consequences of flooding will be evaluated based on the developed assessment and modelling simulations. Sustainable solutions of adaptation and mitigation will be sought based on the risk assessment and simulations.